Lena Cuthbertson, BHSc (OT), MEd, PMP, leads the province of British Columbia’s strategy for measurement and reporting of patient-centred care in alignment with the strategic priorities of BC’s Ministry of Health and seven health authorities. 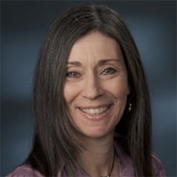 Lena is a surveyor with Accreditation Canada, specializing in rehabilitation, acquired brain injury, long term care, home care, and health systems, and has provided advisory services for health standards organizations on patient- and family-centred care. Lena was a Picker Institute USA Fellow between 2004-06, exploring resident and family experiences related to loneliness, helplessness and boredom in residential care. Lena has supported the patient-centred measurement initiatives of many organizations, including the Canadian Partnership Against Cancer, Canadian Foundation for Health Improvement, Health Quality Ontario, Ontario Hospital Association, Canadian Institute for Health Information, Nuffield Trust, King’s Fund and National Voices UK, Picker Institute Europe, International Foundation for Integrated Care, Bureau of Health Information, NSW, Australia, and British Columbia’s Office of the Seniors Advocate. Lena is passionate about translating data into information…and information into action to improve the satisfaction, experiences and clinical outcomes for patients and their families across the healthcare system.